Many in the scientific community believe that if the American public were more informed about the science behind climate change and energy issues, people would hold views that aligned more closely with those of scientific experts. But how much people know about science only modestly and inconsistently correlates with their attitudes about climate and energy issues, while partisanship is a stronger factor in people’s beliefs, according to a 2016 Pew Research Center survey. 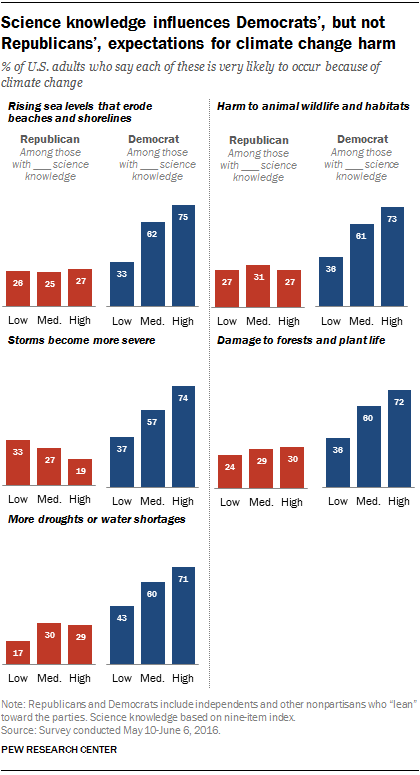 Similarly, Democrats with high levels of knowledge about science, based on a nine-item index, almost all agree that climate change is mostly due to human activity (93%). By contrast, 49% of Democrats with low science knowledge think this is the case.